An analyst downgrade has investors less optimistic about current turnaround efforts. Shares of e.l.f. Beauty Inc. (NYSE:ELF), a cosmetics company offering products that include eyeliner, mascara, lipstick, and many others, are down 16% as of 11:47 a.m. EST Thursday after the company was hit with another analyst downgrade. Wells Fargo analyst Bonnie Herzog updated e.l.f. 's price target to $8 per share and gave the stock an underperform rating. "We see downside risk to consensus top-line, margin pressure from increased advertising (in an attempt to regain top-line momentum) and potential tariff risk as ELF imports nearly 100% of its COGS from China," Herzog noted to investors. It's another blow to investors who have watched the stock consistently trend lower over the past year. 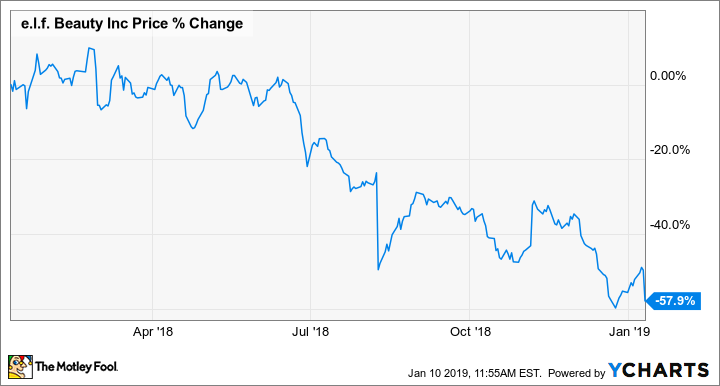 Thursday's downgrade from Wells Fargo signals analysts are less optimistic about the company's turnaround efforts, especially considering the added uncertainty surrounding tariffs. Investors were looking for more momentum from e.l.f. after its third-quarter results managed to top estimates on the top and bottom lines, despite an 11% decline in revenue. Management has its hands full investing in the e.l.f. brand and optimizing its 2019 shelf sets in an attempt to boost sales in brick-and-mortar stores. Check out the latest e.l.f. Beauty earnings call transcript.